I hope you have it warm and cozy, where ever you are. I colored white embossing paste with distress inks and smeared it onto the stencil. While it was still wet I sprinkled glitter onto the steam. Made a little see-through baggie for my tea bag (from some left over stamp wrapping) and adorned it with the snowflakes. Sponged in some distress ink and added the sentiment and some splatters. Very pretty!! Thanks for joining us at Make My Monday! A wonderful showcase of the tea stencil - and adding the tea bag is the perfect special touch! Festive and fun! du bist einfach meine STENCIL - QUEEN !!!! Love this stencil, beautiful card! Happy Holidays! Love that whispy image! Great card! You floor me with your cleverness. The card is really beautiful...the fact that you made it a gift is stupendous. 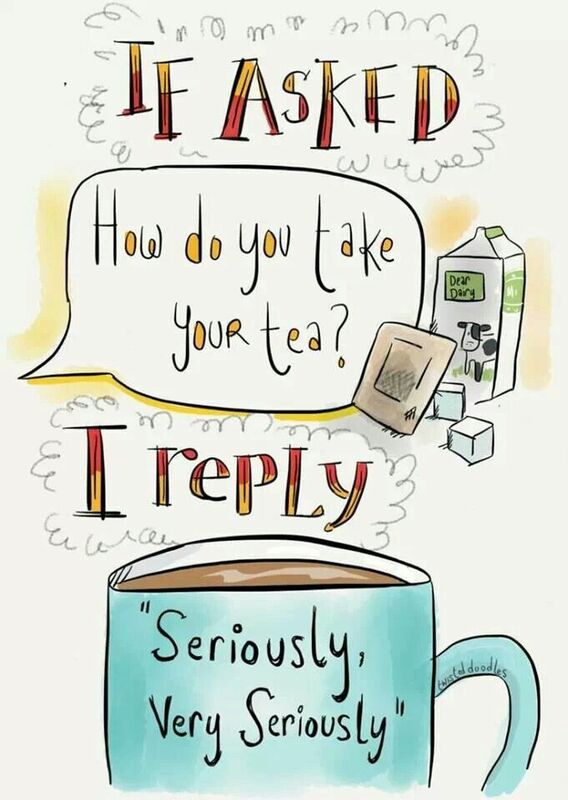 I also take my tea very seriously! My favorite might be Twinings Earl Grey. 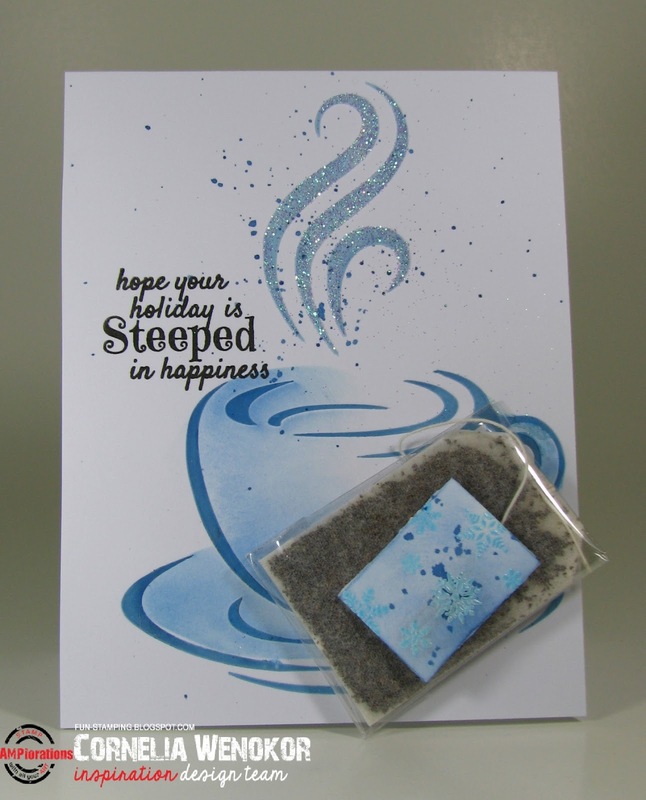 Love tea and love your fabulous card! I love it! Love it! Love it! Did I say that I love it? This is so clever and creative! Amazing make! This is STUNNING!!! I LOVE the addition of the tea bag on this. So clever!! Great card, love the technique you used on your steams of coffee, the splattering of sparkles. Deine Ideen !!!! Jedesmal umwerfend !! eine Superidee ist, gleich einen Teebeutel an die Tasse zu hängen. Dir und deiner Familie einen geruhsamen 3. Adventssonntag. Such an awesome card, love that stencil and the added tea bag! Adorable card - love the stencil and the tea bag ! Great card for the hop. This is gorgeous! I love the colors and that touch of sparkle! Wonderful card with that real teabag! Could add a gift inside the bag. Wonderful idea. So simple and sooooo pretty!! Love it! this is a great card! I esp like the glitter!! Very creative card! Love the tea bag and the sparkling vapor! Oh wow - not only a beautiful card Cornelia but a little gift attached as well - makes me want to go brew up some tea!!! WONDERFUL inspiration. j. This is so pretty. Love the little tea bag. Love the blues and all the sparkle, Cornelia! Simple and gorgeous! That is one fabulous card with amazing work with stencil!! Love the way you add some shadowing on the image.